In the previous modules of Handmade Type (Part 1) and (Part 2) we have covered various mediums, explorations with them and experiments resulting in typefaces. They have helped us understand different types of letter forms, their weights, what different mediums express and so on. Previously the assignments were smaller in composition and space making it easier for smaller groups of students to work together, bringing in their own ideas. In this module we shall see how typography becomes dynamic when it blends with collaboration turning into an interactive installation. The number of people working together to create this type are more, making it a fun project to work on. 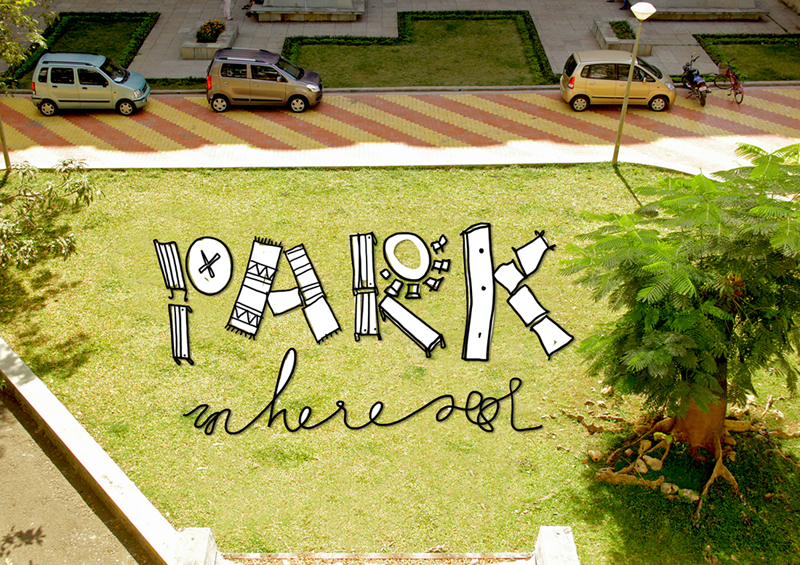 The classroom moves outdoors as the entire assignment has to be executed outdoors owing to the size and space required for creating the type. Let's see how students have explored the word 'Park here'. • What can you think of when you read the word? • Where could it be made? • Why should it be made here? • What are you trying to convey through the word? One needs to chew over these questions in the mind, while conceptualizing.